Manchester Friends of the Earth welcomes the development of a plan that will shape the region’s development over the next 20 years, and seeks to address key issues such as health and well-being, inequality and environmental protection and improvement. We particularly welcome the focus on policies to protect, conserve and improve wetlands and uplands. With national governments failing to take the urgent action needed to avoid climate breakdown, it is more important than ever that our city regions show leadership and reap the benefits of the low carbon transition for jobs and quality of life. It is good to see Greater Manchester’s commitment to be ‘carbon neutral’ by 2038 and to reduce climate change emissions by 15% each year. The plan rightly highlights access to green space and clean air for everyone as a priority. We will need radical policies and programmes to achieve this. 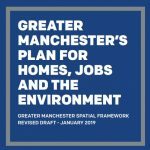 However, we would highlight the inconsistency between the health/well-being, inequality and environmental protection/improvement policies outlined in the revised Greater Manchester Spatial Framework and the choice of development and site allocations. supports the idea of “simultaneously” maximising economic, social and environmental benefits and minimisation of adverse impacts, but do not support net gains in an environmental context. wholly supports new developments being zero net carbon but asks whether too much time is being given for developers to meet the GM 2038 carbon-neutral deadline – the compliance date should be brought forward to 2021.
believes that the revised GMSF fails to be compliant with NPPF paragraph 134 on green belt purpose and paragraph 136 in terms of ‘exceptional circumstances’ through local plan review. The spatial framework has not engaged (for example as would be required under the duty to co-operate) with the local plans for the areas which it covers, nor have exceptional circumstances been demonstrated.